Programming the blue channel. Note the blue jumper has been removed so that the 6-pin ISP cable can fit. 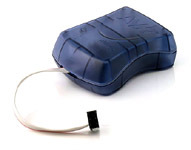 Replace the jumper after programming, and cycle power before using the PEG. First, if don’t already have your computer set up for programming AVR chips, then read the article on programming firmware. You’ll need software installed on your computer (Homebrew+avrdude, AVR Fuses or CrossPack for OSX, or AVRStudio). Now, remove your PEG from your rack and power it up. You may need a longer ribbon cable, or somehow rig something up so you can keep it powered on while programming. 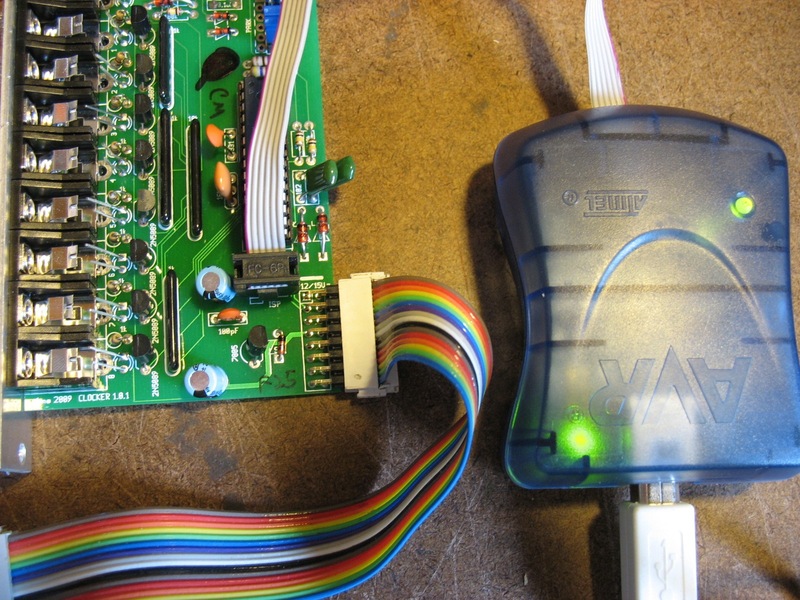 Next, connect the AVR ISP programmer to the 6-pin header under the red channel chip. Note the red stripe orientation. On your computer, flash the code to the PEG. See photo below. Next, connect the 6-pin ISP cable to the blue channel header that’s to the right of the blue channel chip. You’ll have to remove the blue jumper from this header, and replace it when you’re done. Flash the code onto the blue channel. Finally, disconnect the AVR ISP and turn off the PEG, and then turn it back on. This final step is necessary because the jumper on the blue channel is only read at boot-time, so the PEG must be turned off and back on with this jumper installed. To clear up any confusion, notice that there’s a second blue jumper on the PEG that’s located near the power cable. Just leave this alone during programming. The blue jumper that’s mentioned above is located next to the blue channel AVR chip (towards the top, center of the board). Normally, you won’t have to do anything to the fuses. 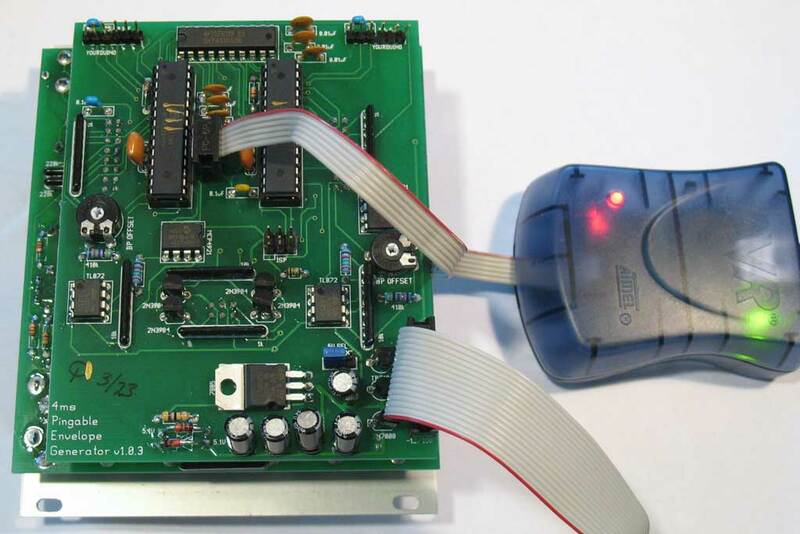 But if your chips got a static shock, or if you are using brand-new chips from mouser or an electronics supplier (as opposed to chips that you bought from 4ms) then you will need to program the fuses. (Assuming that the file peg.hex is in the current directory). This runs at -B 0.5 which is must faster! A number of 4ms devices use an AVR microcontroller. These chips run a small program. On most 4ms devices that use an AVR chip, there’s a 6-pin header (2 rows of 3 pins) near the chip. 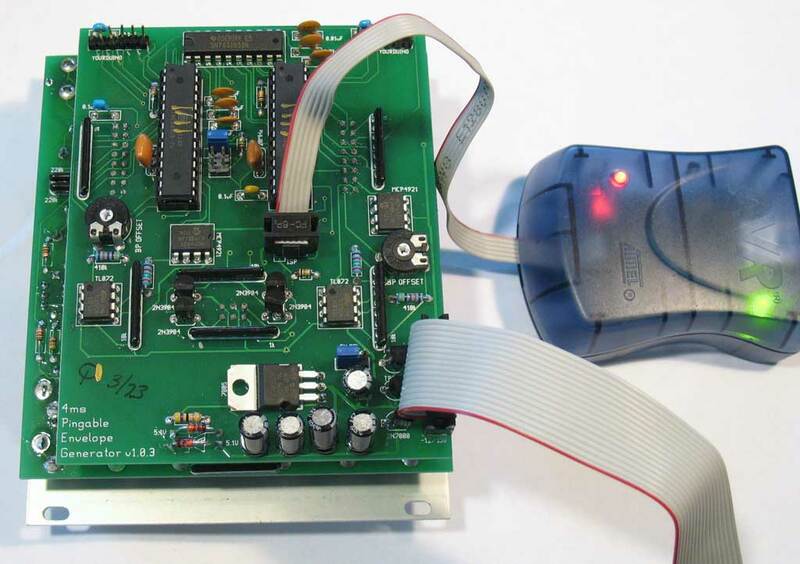 This header lets you update, upgrade, or hack the AVR chip. Linux: You just need the avrdude program to burn code, but can install the whole avr-gcc toolchain if you might be compiling your own firmware. If you’re programming a PEG, read this article specifically about the PEG before continuing. The QCD has four ATtiny85 chips: one for the tap button and one for each of the four channels. Each chip has its own 6-pin ISP header. 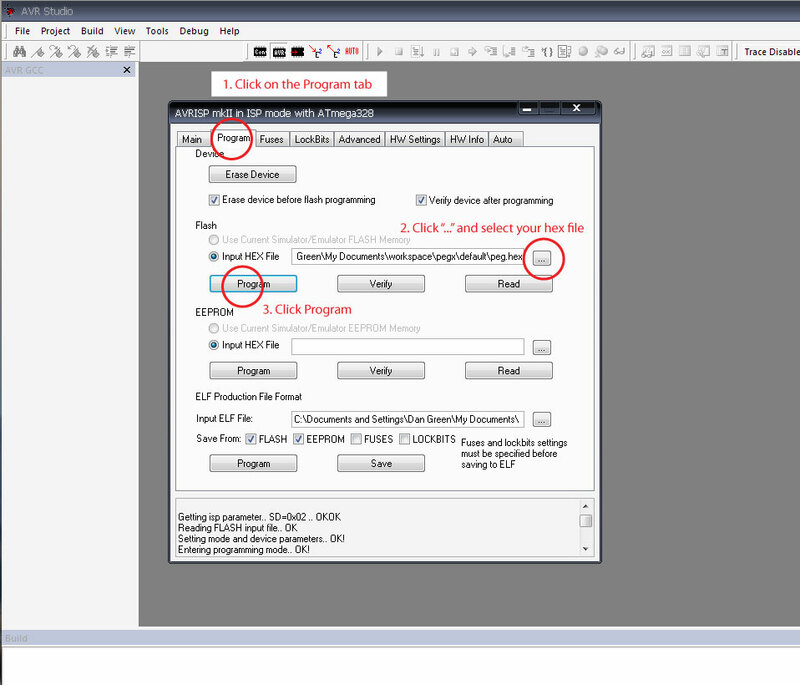 To program the channels, you must apply a gate signal to the Reset and CLK IN jack for the channel you’re programming. The gate signal should be 5V or more. Note: It’s usually fine to use a passive mult to split one gate signal to all the Reset and CLK IN jacks. The QPLFO has four ATtiny85 chips: one for each channel. Each chip has its own 6-pin ISP header. To program the channels, you must apply a gate signal to the Reset and Ping jack for the channel you’re programming. The gate signal should be 5V or more. Note: It’s usually fine to use a passive mult to split one gate signal to all the Reset and Ping jacks. Download and installAVR Studio 4.19 from the AVR Studio Archives. Run the installer and click OK/Next to everything. Yes, you want the “Jungo/USB” driver to be installed. 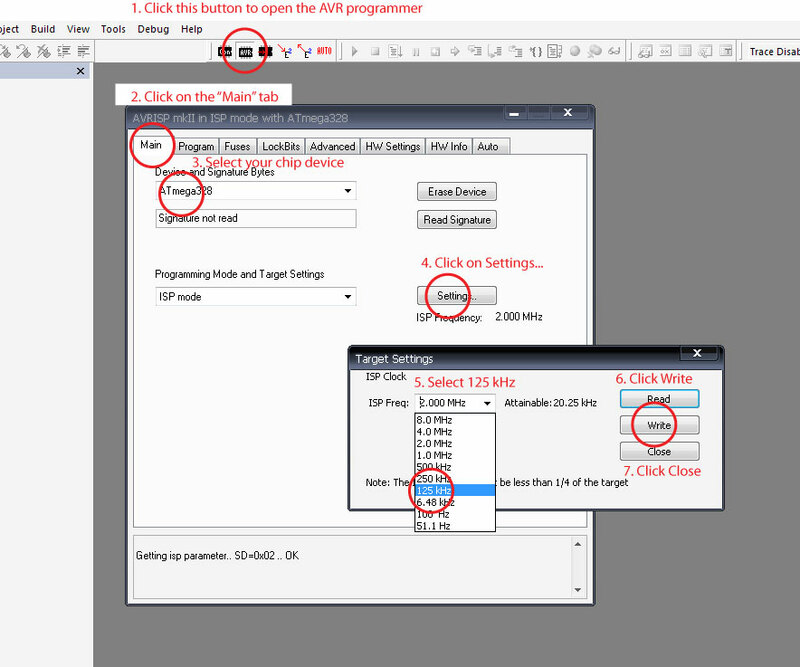 Plug in your AVR ISP mkII into the USB port and make sure Windows finds it, and automatically installs the drivers. The green light near the USB plug should come on. Plug the 6-pin ISP header of the AVRISP mkII into your device. Note the orientation: the red stripe should go towards the white box that’s printed on the PCB: see photo above. Click on the “Main” tab, and select “ISP mode” from the bottom box. Click “Settings” and choose an ISP Frequency of 125kHz. Unplug your ISP 6-pin header and you should be good to go! Download and install AVR Fuses. Select File->Preferences in AVR Fuses. Set the location of avrdude (it probably will be /usr/local/bin/avrdude). Plug in your AVR ISP mkII. The green light by the USB plug might not come on. Select the hex file you downlaoded in step 2, and burn it onto your chip! Download the hex file for your upgrade. Save the file in your Home directory, so you can find it easily with the Terminal. In Terminal, type “ls” and hit enter. You should see the name of the hex file that you saved in your Home directory (along with everything else in your Home directory). If not, you didn’t save it in the right place. And press enter. This assumes your hex file is named “clocker.hex”. It should say “avrdude: Thank you” and have no errors above that. If all goes well, unplug your 6-pin cable and your RCD is updated! Follow the OSX instructions starting at step 2. Hint, if avrdude is not finding a usb connection, you might need to type “sudo” before the avrdude commands. Then it’ll ask you for your password before running avrdude. Unveiled at the beginner’s class at Handmade Music Austin #4, the SimSam (Simple Sampler) is a single-chip “sample-rate cruncher” that’s glitchy as all-get-out but only costs about $8-$12 in parts. It’s an effect with an input and output jack; and it’s a noise-maker since a jumper shorts the output back into the input when nothing is plugged into the input jack. We built 28 SimSams in a couple hours at the workshop. SimSam 2.0 is an improved version that runs the same code as v1.0 (thus has the same functionality), but adds a Reset button. This button is on the left. The other two buttons are the same as SimSam v1.0. Also, on the PCB v2.0 there is a spot for a fourth button underneath the middle button. This is not used and only for testing/hacking your own firmware. Really, it will do nothing (except possibly damage the chip) if you install a button here, so don’t think about it. The code uses it as an output, low when the code is initializing and high when it’s running.